A traditional music score can fill reams of paper. But make music generative, and a tiny amount of musical DNA can breed musical events. How little DNA is needed? How about 140 character worth – enough to fit into a single Twitter post? Mac / Windows desktop + plug-ins (standalone version, VST plug-in for your favorite host, and even a plug-in for playing and customizing mixes right in your web browser). Cost: US$19.99. Windows Mobile: smartphones and PDAs (yep, an eBay purchase could be wise right now) for playing and customizing mixes. Cost: US$4.99. 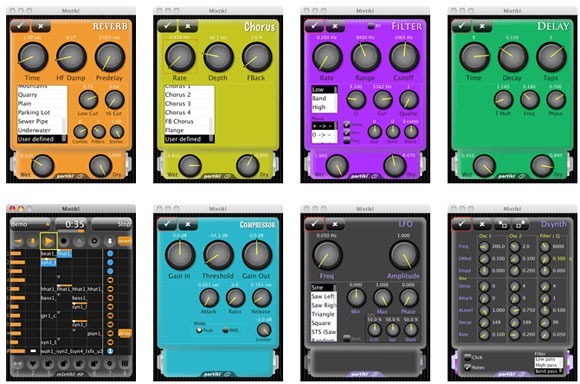 iPhone / iPod touch: Mobile generative playback and synthesis, pricing TBA. This version isn’t available this instant, but is expected for approval in the upcoming days. Mixtikl actually binds together a range of musical materials, from pre-defined tunes and audio assets to generative files and custom mixes of the two. There are other powerful features, two including the Partikl multi-synth and a built in “network” effects system. There’s more work to do for Intermorphic: right now, Mixtikl, as the name implies, is a mixer. If you’re interested in producing your own musical patterns, editing rules, and the like, these features will have to wait for an upcoming release. But right now, you do get a taste for some of what they’re working, and if you’re not yet interested in investing, 30-day trials are available. And yes, you can bet this will get the attention of those in the know in the Tweetosphere. None other than British celeb geek Stephen Fry is playing around with it.